Local associations must adopt and implement a concussion/brain injury management program to battle looming liability crisis. For the past three years, Sadler Sports & Recreation Insurance has been urging our youth tackle football clients to implement comprehensive brain injury risk management programs to help to prevent injuries and resulting lawsuits from becoming insurance claims. 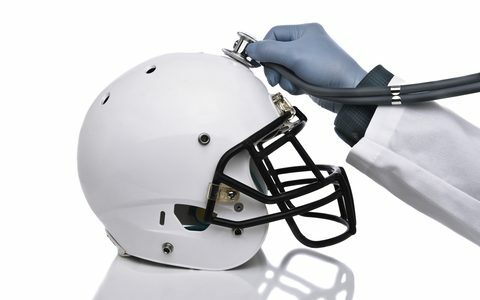 In the event that a lawsuit is filed by an injured participant, whether from a single concussion, multiple concussions, or cumulative traumatic encephalopathy (CTE), it is crucial for a local association to show that it has complied with the national standard of care for brain injury protection. Doing so not only protects the players against injuries and the association and staff against lawsuits, but also protects the General Liability insurance carrier, which makes it more likely that brain injury coverage will be available in the future. In a negligence-based lawsuit, the claimant filing the lawsuit must prove that a duty was owed, the duty was breached, and that the breach was the cause of the damages. The duty that is owed is also known as the standard of care. The standard of care to protect against brain injury for youth football players will be determined by state legislation, case law, sanctioning and governing bodies, risk management resources, and expert witnesses. Depending on the source, some standards are mandated and others are recommended or are just guidelines. However, understand that the claimant’s attorney will argue that even recommended standards and guidelines should be implemented by a reasonable and prudent youth football association. The following elements should be considered by local tackle football associations when developing their concussion/brain injury risk management program. A written risk management program should be adopted by board action and communicated to all administrators, staff, players, and parents. A written program that builds in accountability is much more likely to be implemented than a program that is not in writing. Coaches should receive training and certification in both 1) concussion basics for youth sports through the CDC Concussion Training Course, NAYS Concussion Training Course, or a similar online course, and 2) a tackle training program on how to remove the head from the tackle such as through Seahawks Tackling. Players and Parents should receive and be required to sign off and return to the association a concussion fact sheet handout from the CDC or a similar source at the beginning of every season. The local association should maintain documentation of coach training certificates and player/parent fact sheets for 15 years. Note that a 5-year-old child may wait until age 20 in many states before filing a lawsuit for a past injury. This is a rapidly changing area with the emergence of new, lower-cost technologies where baseline and post-injury testing can be delivered on the sidelines through smart phones and tablets. So far, baseline neurocognitive testing is considered to be a voluntary measure in most instances. The highest medical authority (M.D., D.O., athletic trainer, or person with EMT or Red Cross certification) at a practice or game should make the call in terms of signs observed by parents, guardians, or sports staff and symptoms reported by player. The highest authority must be aware of danger signs that would result in an immediate trip to the emergency room and in questions to ask and exertional maneuvers to perform to identify a potential concussion. Identification of potential concussions is a rapidly evolving area with a number of new tools that have recently hit the market or that will soon be available, such as helmet impact indicators, smart phone/tablet apps for sideline testing of memory and fine motor coordination to compare to baseline results, tablet eye-tracking devices, telemedicine with doctors via smart phones, etc. Remove the athlete from play, make sure the athlete is evaluated by an M.D. or D.O., inform parents through the CDC fact sheet, and keep the athlete out of play until written return-to-play medical clearance is received from a qualified medical provider. Some state concussion laws allow return-to-play medical clearance by a “health care provider” which may also encompass professionals such as physicians’ assistants and nurse practitioners. The Datalys Study by Kerr indicates that limiting contact at practice may reduce concussions in youth tackle football. Governing and sanctioning bodies have started to adopt contact limitation guidelines. This has always been and continues to be of critical importance in protecting youth football players from head and neck injuries. A number of online guides and videos are available from helmet manufacturers to assist coaches and equipment managers in this area. A list of these sources can be found on the risk management section of our website. Any risk management program should comply with the standards as prescribed by state concussion legislation (this only applies to schools in some states) and governing body (USAFB) and sanctioning body (AYF, Pop Warner) requirements and recommendations. Based on my 30 years of experience in the sports insurance niche and the potential for brain injury litigation, I would not want to be a board member or staff member involved with a youth tackle football organization that did not have an effective, formally-adopted and fully-implemented written concussion/brain injury risk management program. Sadler Sports & Recreation Insurance has developed a sample concussion/brain injury risk management program for our youth football clients that incorporates the elements listed above and that can be downloaded from our website in WORD document format.